In Defense of Me | I Should be Writing! 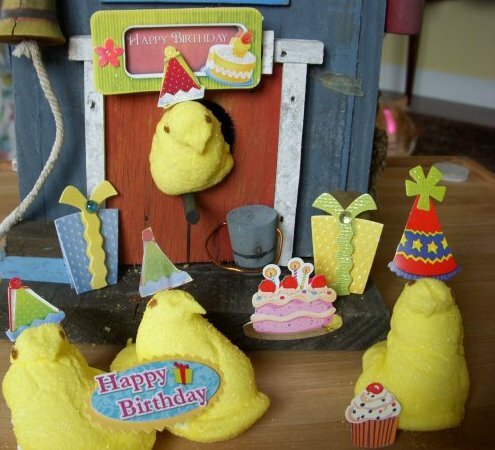 Yes, I gave the Peeps a party…and then I ate them! I have a very good reason for not writing my Book Blog today. I enjoyed a delicious lunch with a friend and came home and spent hours editing my latest novel. I kept meaning to stop and write my blog, but before I got up from my chair the afternoon just got by me. I’m a terrible liar…that’s not what happened at all. The truth is I got myself into a little bit of a sugar-high followed by a giant sugar-crash. And there you have it. I’m sure you’re asking yourself…what kind of idiot eats that much sugar? This one. Most adults cringe at the thought of biting into a sugary-neon-colored marshmallow Peep. Not me. I’ve been known to eat a whole box in one day. All right, I confess, one box in one sitting. That’s a whole lotta Peeps. But, I stand by the squishy, mushy, sugary chicks and bunnies. It’s like biting into a little piece of Heaven. It makes me laugh everytime I do it. My husband only laughed the first two times. Now he won’t say anything until I bite off its head ensuring I won’t sink to using the same joke numerous times in a row. It really does make me laugh EVERY time. More confession: I have a terrible candy addiction, but my neurosis goes deeper than that. It has to be a certain kind of candy for that particular time of year. Let me explain. It goes something like this: At Easter I must have yellow chicks or bunnies (pink ones are not as good, butI’ll eat them if they’re in front of me). Fall: candy corn—all kinds of candy corn (they come in flavors now), Christmas: cherry cordials. In between all major holidays and in addition to the holiday candy…any kind of candy that can be found at the counter of the movie theater (i.e. Milk Duds, Twizzlers, Junior Mints etc.). However, I simply cannot eat certain kinds of candy any other time of the year. Candy Corn in the summer? Preposterous! I admit it. I am addicted and my dentist hates me. No, really. He does. So, you’ll never believe this: I went to lunch at a health food store today. Yep, me. In a health food store. Eating. And here’s a real shocker: this was my third trip—and I have a punch-card to prove it. The first time (a couple of weeks ago) I was skeptical…or more like hesitant. Okay, maybe I was horrified and repulsed at the thought, but I was with two friends who don’t ply their bodies with sugar and caffeine at unvarying intervals and constant inhuman levels, so I agreed. I suppose no reasonable person exists on a diet of sugar and cheese. Of course, I’m not a reasonable person and besides, I was outnumbered that day. I stepped up to the counter and studied the menu. Shockingly, it looked pretty good to me. Living in West Texas, I am almost certain this is the only restaurant in 200 miles that doesn’t have some sort of barbequed animal on its menu. Be it pig or cow, you can get your fill pretty much anywhere–at Rite Aid, Joe’s Hardware or in a shack in front of the Little League park. I once was in an expensive antique furniture store and upstairs, in the back…you guessed it. You could get a pulled-pork sandwich and home fries. In an upscale furniture store! Here in the Lone Star State they serve BIG pieces of barbequed beast. I mean plate-size portions. If there is a little bit of room left on the ginormous plate, they might throw on a couple of green beans (with bacon), but those and any other vegetables are really superfluous. This is MEAT country. I’ve eaten so much beef since we moved here that I’m beginning to moo instead of scoff and I’ve had enough pork to squeal at the slightest provocation. Wait…to be fair, I think I did the squealing-thing before we moved out west. I could almost swear I never moo’d before though. So, there I am at the counter ready to order. My friends go first and then it’s my turn. WTF? What on Earth would I do with that? Put it in my hummingbird feeder? “Would you like water or tea?” Now wait…this is not just tea, but, herbal, natural, no preservative, good-for-you-tea. I, of course, chose the lesser of two evils—water. I will admit right here. The food was fantastic! So much so…I went back! On my second visit, I came armed. I had a can of diet Coke in my purse. All was right in the world. I ordered another delicious stuffed avocado. After our food was served, I dug around in my purse until I produced my prize—my delicious carmel-flavored chemical concoction. Mmmmm…. Surprisingly, this restaurant is popular. Why do I find it surprising? Well, I wouldn’t if it were located pretty much anywhere else. This place is like a little oasis in the desert for artistic-types. This restaurant does NOT have a sign out in front that says, “No Concealed Weapons” like some of the eating establishments around here. (Apparently, you can’t conceal your weapons while in some restaruants, but it’s probably okay to bring your shotgun in and set on the counter or across the table. They just don’t want to be surprised by your gun slinging. I mean if it’s out in the open, then it’s fair game—you’ve been warned.) But I digress…. This place is filled with people whom I’ve never seen walking around anywhere in this city. It’s almost like the restaurant imported these people from California just to add ambiance to the earthy bistro—okay maybe not imported from California, but Austin, at least. Never has the sound of a pop-top echoed through a building like it did when I opened my contraband can. Every head turned my way as they attempted to spot the heathen who brought poison onto hallowed ground. What heathen besmirched the sacred dining facility? Turning red, I said, “Yes. I’m sorry.” At that moment, I really was sorry. Sorry that I hadn’t opened my can outside before we came in. “It’s all right. Don’t worry about it,” she said. Everyone went back to eating. I have made some very good friends here because neither of them pretended not to know me. But, the woman at the counter? I knew by her expression that she pretty much wrote me off as a chemically-altered, caffeinated, preservative-laden cretin. She wasn’t wrong in her assumption, either. I’m surprised my body didn’t reject the organic-nature of my meal. Today was my third visit. I was with a different friend. We were going to a museum and spontaneously stopped for lunch. Damnit! I didn’t have a diet Coke in my purse. I’m beginning to think it may not be a bad idea to carry a spare. But…I survived drinking the water and the food was once again fabulous. I opened up a big bag of red Cherry Sours candy from my purse (I always have candy in my purse—I’m like a grandmother—except my candy isn’t hidden under used tissue and sticky with hairs attached—most of the time, that is). So, I open up my bag of death. OMG! Sugar and RED DYE. We had the cutest young server who looked the part—I mean he could’ve come from Central Casting at Warner-Bros studio after the director found him in the actor-catalog-of-headshots under : cool, sensitive, hippie, tree-hugger poet/lyricist-type—with dimples. This kid could’ve been made to order—but what was he doing in West Texas? Anyway…he thought eating the detrimental-to-all-living-creatures-candy was akin to signing my own death warrant. I popped three in my mouth. “Did you know we sell organic, sugar-free taffy by the cash register?” he asked cringing as I happily chewed the delicious Red Dye #4 covered in sugar. I passed on the taffy. What’s the point of putting my body in shock? It’s so used to the sugar-high, sugar-coma routine now. And besides…sugar-free taffy? Why not just pop an eraser in your mouth? Ick. Next time I go in (and there will be a next time) I’m bringing my diet Coke and a box of Peeps. What can I say? I’m a conformist in a non-conformist restaurant. If you haven’t had a saffron marshmallow bunny in a long time, g’head, try one again. You’ll enjoy it. If your body hasn’t built up a resistance to large doses of sugar, don’t eat the whole box in one sitting. It WILL put you in a sugar coma. But, on the bright side, you’ll have a good 12 hours sleep–that is, after your spouse peels you off the ceiling from the sugar high. And that is why I do not have a book blog today. Loved this! Did you know that peeps now come “sugar-free”? Your Dad has gone through 12 packs (3 to a pack) since the local drug store starting selling them 3 weeks ago. Not cheap… 99 cents a pack. So he is a happy camper but feels guilty that he is to blame for your peeps and chicks addiction. Oh, and if you are interested, read the “ingredients” portion on the pack. Not just marshmallow! But enjoy anyway. They will go bye-bye in 3 weeks. Your dad plans to go to the store the day after Easter because the will be 50% off. The he will stash them. Daughter like Dad. Sugar-free?? What’s the point? Oh…poor daddy. I’m not looking at the ingredients. Ignorance is bliss. I just close my eyes and bite into the sweetest, most wonderful taste in the world. Tell him not to feel guilty. It was probably genetics. I always buy a bunch after Easter, too. Once the cashier asked me how many kids I had. I couldn’t tell her they were all for me and my kids wouldn’t touch them with a ten foot pole. Yeah…I’m bad. Thanks for the laugh today!! You and your peeps!! Miss you…BTW, I haven’t had a diet soda since Nov 29th…4 months today!! Miss it but not enough to go back. I’m down 40lbs and happy about that! Miss you, too, Melinda. I have to ask…where are you getting your caffeine?? You gave that up, too? Congrats on the weight loss! That’s awesome! Loved your line,”I’m beginning to moo instead of scoff”. Will NEVER understand the peeps addiction. Nasty, nasty little things. And what I’ll never understand is how you can eat all the sugar and caffeine and still be so teeny tiny. If you’d been born a Goodfellow, you’re dentist would love you (we have great teeth) but you’d be fat! OMG!! I typed “you’re” instead of “your” and now I can’t correct it! I’m completely humiliated. LOL – Luckily, the boys got the Goodfellow teeth. I’m dead dog serious about my last dentist (the one in PA) hating me. He wrote on my record: Patient left AMA (against medical advice) and Uncooperative. LOL – he wanted to do another root canal. Like I’m going to let anyone do another one of those on me. Not. Going. To Happen. Lots of cow and Peeps and diet coke, it’s a wonder your body didn’t know what to do at the health food store!!! The food is good there though – interesting choices – but good. Yeah, I thought my body would reject the natural food. It seemed to process okay as soon as I got some chemicals and sugar inside to counter-act the healthy stuff. LOL! Because I have actuallly witnessed your sugar addiction many times, this is extremely funny to me! I now know why you always have such a ginormous purse with you! It is full of red dye #4 and DIET coke. Of course after an entire box of peeps, why would you add another single ounce of sugar to your body with a REAL coke? And I see by your mom’s response that you can’t help yourself….you are genetically addicted to peeps. Do they have peep rehab???? Will you die of embarrassment when I carry my diet Coke and Peeps in with me tomorrow? Ha! Good choice of restaurant, too. I have a punch-card! Woo Hoo! You need to be writing the ads for the Peeps company girlfriend! Miss you oodles and our crazy candy-alcohol shared times. Health food? Ugh! Yum Candy… My spring addiction is Jelly Beans. Your blogs are terrific. I LOVE jelly beans…except the black ones. Don’t like black ones, but G loves them so we’re a great team. 🙂 I’m glad you like the blogs. Thanks for reading. Peeps are okay, but the pastel M&M’s are the best. There is just something about the pastel colors that make them better LOL! No more sweat tarts? One thing I remember about you at Sac State is your grilled cheese everyday and sweat tarts. You had a supply for every class. Kris I laughed out loud when I read this post. Very funny! Is the tuna stuff trailer trash food that he likes, tune casserole? I am not a sweets eater (prefer sunflower seeds if you remember), but at Easter I always buy one container of chocolate covered marshmellows and eat them all myself. My kids don’t like them. I hate to admit it and it’s weird because I dont’ really like chocolate. Greg LOVES sunflower seeds. Yes, the trailer trash tuna is tuna casserole. He loves that stuff. Stephen loves it, too. In fact, it’s one of his favorites after Shepherd’s Pie. BTW – I love chocolate covered marshmallow bunnies! Yes! You got it, Aaron. You must use the “Peep Voice.” I forgot to mention that part. Truly, I am twisted when I’m around Peeps. Thanks for reading! So, with Easter about three weeks away, are you preparing for a massive Peeps culling? Their numbers have grown to unsafe proportions and their numbers must be reduces, lest the entire global ecosystem fails! There are all sorts of ways to torture them before commencing with the eating. A Peeps guillotine would be entertaining, though the gooey nature of their internal organs might lessen the drama of heads rolling—a major downer. You could go all Aztec on them, construct a temple, rip their hearts out, and toss them down the temple steps. Dissection, Death by Nibbling, and Peeps roasted over an open flame while being crushed inside an iron maiden of graham crackers and chocolate are also good ways to go. You are freakin’ hilarious, Chris. You should write a book. 😉 Love your imagination. I liked the death by nibbling the best. What an imagination you have. Kristine: I saw the video that I’ve attached the link to above and thought of you. Peeps, Mad Men-ish heroines, liquor, girl power, creativity, plus light comedy and snark makes a good combo. Hah, GREAT stuff, but personally, I’d take the hunk of barbequed beast (the ONE thing I miss about TX is the BBQ). I have to pass on the sugar…can’t be having the waistline going out…no way.